The weather has completely changed. Extremely strong winds and freezing cold, with rain expected. This led us to decide on a restaurant for lunch, so we chose Taste Canowindra, a place promoting regional foods and wine. We were greeted in a very strange way, by a very abrupt owner, but stayed and tasted a couple of local wines and ended up booking a table for lunch. There was a delicious Rose and it was only $10.00! We ended up buying a dozen and the price came down to $6.20 per bottle, and it was organic! After we sat down for lunch, we noticed one group of eight people and another couple leaving the tasting area after waiting too long for the owner to receive them. I can see a business going down the drain. In contrast, the waitress was excellent as was the food. At lunch we ordered a shared platter of regional goodies including, Turkish bread with olive oil and Dukkah, goats cheese, olives, chorizo, spiced prawns, chicken terrine, caper berries, with lettuce and cucumber, all washed down with a bottle of our cheap, but delicious, Rose. This part of their business might be their saving grace. 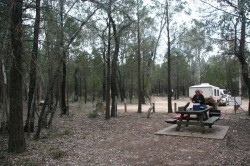 After packing up in the rain, we headed to Conimbla National Park for breakfast. I thought Conimbla NP was a bit spooky, mainly because the forest was very dark, with the trees growing very close together, not allowing much daylight. There was also a surveillance camera at the picnic area. Nevertheless, we cooked toast, eggs and bacon on our $20 portable gas stove and enjoyed having breakfast on the way to our next destination. The photo doesn’t depict my feelings, so maybe it was just me! On the way into Junee we passed the railway spiral on the Melbourne to Sydney railway that was built to enable larger and faster locos to carry freight during the second world war. The track goes round 360 degrees as it climbs to a higher altitude, so the slope is less than would be with a direct climb. The morning we were leaving, we called in to see the Railway Station and Refreshment Rooms, but they didn’t open until 10.00am. 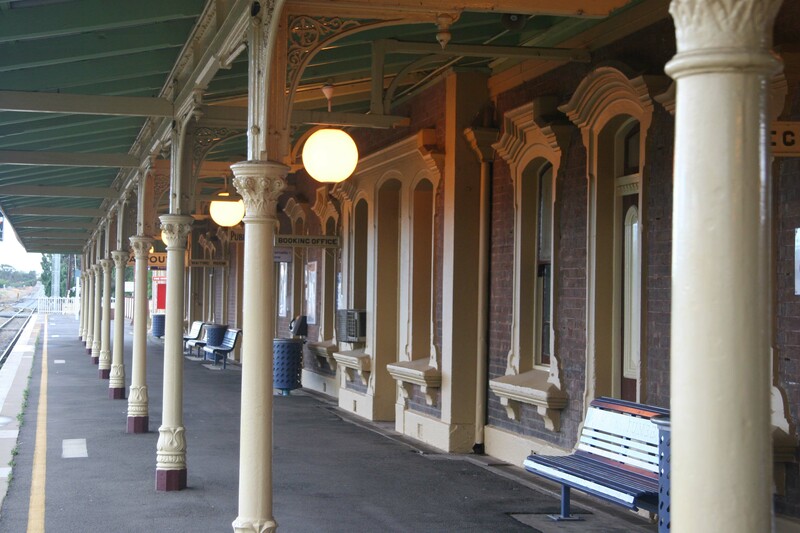 This station serviced the Great Southern Railway from Sydney to Albury. The early photographs show these rooms to be unbelievably grand, similar to our Windsor Hotel. Today the rooms are used as a Cafe. 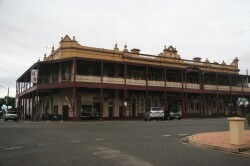 Across the road from the station and railway square was the old Loftus Hotel, now a B & B, one of the old magnificent hotels that are dotted around Junee. Another point of interest was the Roundhouse & Museum, but again, it wasn’t open until 12.00. 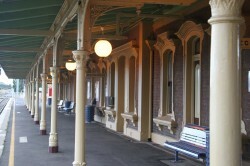 It began operating in 1947, attending to virtually every class of steam and diesel locomotive, rail car and XPT in NSW. When built, the 100 foot turntable was the largest in the Southern Hemisphere, that is no longer the case, but it still operates. Russ was very disappointed not to see this in action and we were unable to get a photograph to show the enormity of the structure. We would like to go back to Junee again and spend s couple of days there. We had planned to spend a couple of days in Harrietville before heading across the high country to Bairnsdale, but the weather for the week looked bad with low temperatures and cold and strong winds, so we decided to head home. 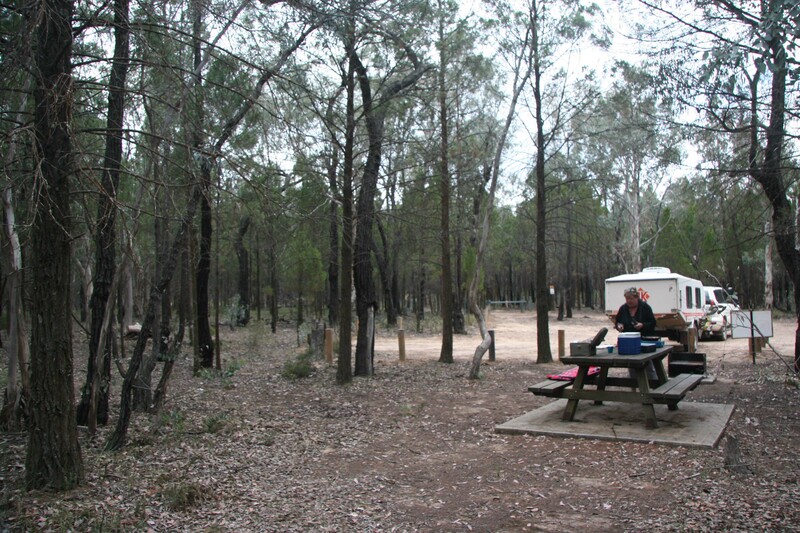 We were going to stop in Benalla, but after a long 9 hour, 550 km drive we are home now – you know what happens when the horses start heading for home? ?